About a year from now, Anne Teresa De Keersmaeker will reach a mainstream audience when she stages the dances for Ivo van Hove’s Broadway production of West Side Story. Both she and her company Rosas frequent BAM, various Lincoln Center festivals and Baryshnikov Arts Center, which over this long weekend presented the New York premiere of the Belgian modernist’s stunning Verklärte Nacht in the Jerome Robbins Theater. There’s no irony intended here. It’s BAC’s largest performing space and the two choreographers are generationally, aesthetically and fundamentally different from each other. 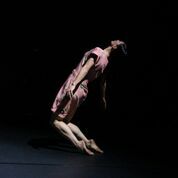 Verklärte Nacht (Transfigured Night), originally choreographed in 1995 and reconstructed in 2014, is based on Richard Dehmel’s 1896 poem of confession and forgiveness. Two years after the German Expressionist published it, Arnold Schoenberg’s composed the atmospheric tone poem that became his best-known work. (Unless the local music director is Barenboim, Rattle, Welser-Möst or Salonen, it’s the only Schoenberg that gets programmed. Boulez’s definitive recording with the NY Philharmonic was used at these performances,) In 1942 Anthony Tudor used the music for Pillar of Fire, a bleak, ingenious variation on Dehmel’s premise. Jerome Robbins was in the original ABT cast, as was Tudor, the legendary Nora Kaye and Sono Osato, On The Town’s first “Miss Turnstiles” who passed away in late December at 99. De Keersmaeker reads more between the lines with Him. Initially, He’s upset and runs around the dark, empty stage The roughest thing He does is push her away with His knees. Very soon though, the “special warmth flickers/From you into me, from me into you” is conveyed when he lifts her and gently cradles her stomach. He then covers Her with His jacket. Ultimately, He convinces Her to look forward to their future and walk alongside Him. Cynthia Loemij was incredible. Her powerful dancing never got in the way of conveying fear or vulnerability. She made Her a complete character. It was also perfect that her Rosas/Rudy Sabounghi costume was a loose-fitting short dress with a pink flowery Wiener Werkstätte design contrasting her dark thoughts. Boštjan Antončič provided Loemij with a calming presence. Igor Shyshko also made a strong impression in the silent Prologue as the indifferent hook-up/biological father. Hi there! I work for FRIGID New York, the theater company that runs the Kraine Theater and Under St. Marks in the Lower East Side. Our company produces about 8 festivals a year, and coproduces new art by emerging artists year round. I was wondering if I might be able to send you folks a press release about our flagship fest, the FRIGID Festival? FRIGID runs from February 20th to March 10th, and I would love to get you some more information.